Since 1970 the Viktualienmarkt beer garden is located at Munich's central food market. 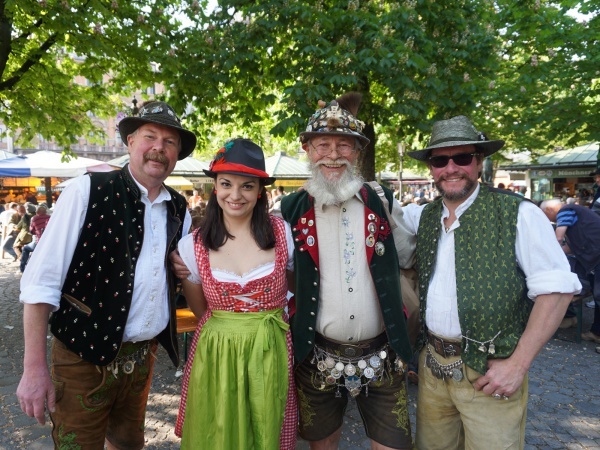 This city beer garden attracts a mixed crowd including many tourists, since the Glockenspiel, a popular tourist attraction at Marienplatz, is located just around the corner. The beer garden has about 600 seats in the self-serviced area and 200 seats in the serviced area, all well shaded by large chestnut trees. Viktualienmarkt beer garden is missing the typical gravel ground as seen in every other traditional beer garden. Instead the beer benches stand on cobblestone. Viktualienmarkt beer garden is usually busy, especially on sunny days during lunch time. In these hours business men intermingle with tourists as well as locals taking a break from their shopping or sightseeing tours. Most of the guests bring food to the beer garden bought from the surrounding food stalls and various fast food chains, creating a symbiotic relationship between the food shops and beer garden. The beer garden's own food stall in the self-serviced area offers traditional Bavarian meals, such as Schweinshaxe (roasted pork knuckle) and oven-fresh Schweinebraten (roast pork). A unique feature of this beer garden is an alternating selection of Munich beer types. Every six weeks a different beer from one of Munich's famous breweries is served from the tap. The six breweries supplying beer are Augustiner, Hacker-Pschorr, Löwenbräu, Hofbräu, Paulaner and Spaten. A Maß Hell (lager) costs €7.60 (March 2017). The beer garden is open daily from 9am to 10pm. The beer garden is also open during the winter months, selling hot Glühwein in addition to beer. This page was last modified on 18 May 2018, at 19:18.